We're proud to be transparent about our Marketplace performance. These automated graphs are the aggregated statistics for the Harmoney portfolio as a whole, and are updated regularly with Marketplace Statistics. You can view your personal statistics in your Lender Dashboard. Since launching in September 2014, Harmoney has continued to show steady and consistent growth in terms of the number of loans, and the amount of money lent through the Harmoney Marketplace. 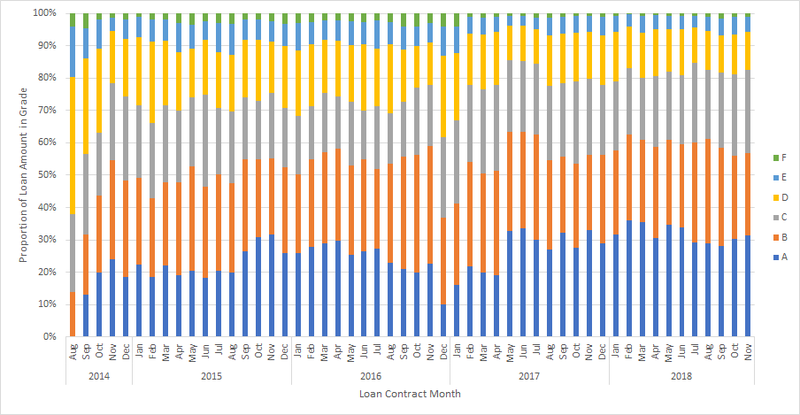 You can observe the seasonality of loan demand represented by sharp inclines during the months leading up to Christmas. This graph shows both Loan Volume ($) on the left axis, and Loan Count (N) on the right axis, over time. Realised Annual Return (RAR) is a measure of the actual rate of return on funds invested on the Harmoney Platform. As RAR is based on historic performance that may not be a good indicator of future returns.In simple terms, RAR takes the income from lending (interest) and deducts the costs you have incurred (credit losses and fees) to provide the net return. The net return is then recalculated as an annual rate and divided by the daily principal outstanding to provide your Realised Annual Return. This graph shows the average RAR split out for Retail Lenders and Wholesale Lender, as well as total platform average. The return of each individual Lender also depends on their diversification within their personal portfolio. This graph shows that 100% of Lenders who have invested in 100 or more personal loans have all returned a positive RAR. You can also see that once you have invested in 200 or more personal loans, the volatility of the RAR reduces significantly. Click here to learn more about Diversification. This graph shows the cumulative total of interest paid to Harmoney Lenders over time. As more loans are funded through the Harmoney Marketplace, interest returned will continue to grow. This graph shows the daily amount of volume that was funded via Auto-Lend. Loans go through the Auto-Lend engine before they hit the Marketplace, but are capped by the 'Auto-Lend Allocation' maximum allocation. This allocation changes regularly as Harmoney actively manages the marketplace. Looking at the loan performance by grade in more detail (demonstrating further that the Harmoney credit grade ranks risk effectively) we see not only that the lower the grade the greater the proportion of arrears but also the greater the severity of the arrears, i.e. Grade F has more loans at >120 days than Grade E and Grade E more than Grade D, and so on. This gives us greater confidence in grading as it operates in our current processes. Charged Off amounts shown in the table are total lifetime Charge Offs to-date. They cannot be directly compared to the annual forecast default rate here as they are not annual Charge-Off amounts. Results may vary. This chart illustrates the actual loss rates experienced. Each year is broken into Half-year groups - or cohorts. Data is updated in real time. It is, however, important to remember that when viewing these losses, that each cohort had a slightly different grade mix, and the amount of money lent in each cohort varies as well. To see a comparison of estimated annual default rates & actual default rates click here. This chart shows the value of loans orginated in each cohort (volume). This is heavily influenced by the grade mix in each cohort (explored in the next graph) as each grade has slightly different borrowing limits. This shows that where the first cohort (2014 H2) has had the highest static loss rate, is also the lowest volume cohort. One of the factors affecting the loss in each cohort is the risk grade mix. In the first month of operation, for example, Harmoney originated no A grade loans. By looking at the two graphs together you can get a better understanding of the population distribution in each cohort. You can see each risk grade's estimated default rate here. As these cohorts mature, we will see a flattening out of the losses as represented in our forecast Hazard Curve. We expect that around 80% of the defaults will occur by around 18 months, which means 36-months and 60-month loans will have a similar default hazard rate. This graph shows a breakdown of the Harmoney loan portfolio by purpose for borrowing. Debt consolidation is a large proportion of loan outcomes, however in a number of cases these loans will also include a portion of the loan funds going to the borrower for an additional purpose; debt consolidation was a means by which this could be achieved (by lowering the current repayment amount of credit to free up income for that additional purpose). The spread of other purposes is varied and a positive thing for spreading portfolio risk. This graph shows the proportion of the loan book broken down by Borrowers' employment status. It shows that the vast majority of Borrowers are skilled workers, reinforcing that we have a prime book of Borrowers. This graph shows the proportion of the loan book broken down by Borrowers' residential status. Almost 50% of Borrowers are homeowners (by loan count) which translates into over $165m by loan volume. The bulk of homeowners fall in the lower risk grades (A - C) with the higher risk grades often being renters and boarders. This graph shows the proportion of the loan book broken down by Borrowers' age. The average age of a Borrower is around 43 years old - slightly higher than the average age of a Lender. 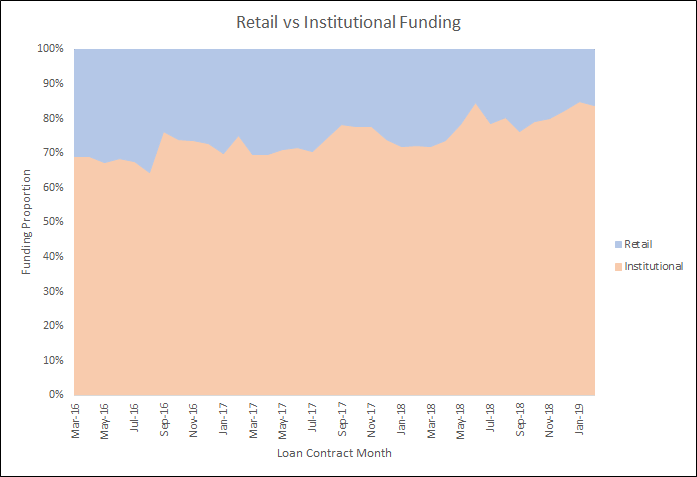 The percentage split of loan volume allocated to retail lenders and institutional lenders varies month to month based primarily on the total number of new loans listed in the marketplace. Maintaining this mix of retail and institutional lenders has enabled us to scale, and continue our growth.